I really must consider attending a support group for my Caddis addiction! Although the weather wasn’t as promising as the previous week there was always hope that those wonderful fluttering insects would make another appearance so long as the generation gods were playing fair. Our wives had granted us a two day furlough so off south we drove, this time taking the boat in case of higher water on the second day. Monday morning started cold and windy with the water level at 450.5 and showing a 50 degrees temperature. There were no Caddis in the air so things were looking a little bleak. The wind continued to blow coldly for the next couple of hours but the sun did began to break through and a few tan Caddis made an appearance on the water surface. I tried a tan emerger Caddis tied in on a #18 curved hook with a swept back elk hair wing and it did the trick as I began taking fish in the water closer to the bank. The white Caddis really didn’t like the conditions but thankfully their tan brethren took up some of the slack and provided good fishing till late in the day. Only two species of trout this time although one was a healthy 17 inch brown. The day was made special by the arrival of my great friend Jeremy who found the energy to fish after three hours sleep and a six hour drive from Texas. So you see “Caddis fever” is really a powerful addiction! Tuesday dawned frosty and bright after a night in Mountain Home and some catching up during dinner the night before. The parking lot had been pretty busy on Monday and we had hoped that things would slacken on Tuesday but it was not too happen. Of course everyone was getting the message about the Caddis so it wasn’t surprising to see more folks out on the water. The water was a little higher today after about four hours of generation the previous evening, meaning the level was still dropping. The additional flow had opened up some nice holding water so we were not in the least disappointed. Caddis began making an appearance around eleven in the morning when the sun was shining and the water had reached 50 degrees. First it was the tan and then the white followed in slowly increasing numbers. The tan Caddis emerger worked well as the hatch began although it wasn’t long before I could change to the olive “furry” foam pattern which produced some energetic rises in the riffles. 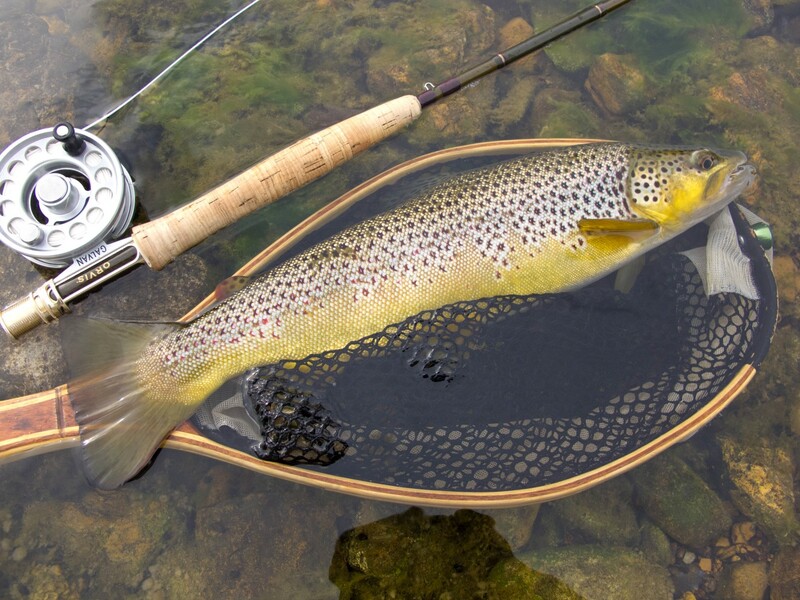 Action was fast and furious with fish rising to the fluttering white Caddis. It was wonderful watching the Caddis emerge through the surface tension and then flutter across the water. The trout would often drift up and lay below the insect before striking with deadly accuracy for the most part although I did witness a few missed takes with the Caddis escaping. After about five hours of almost consistently good fishing it was time to head towards the parking lot, but not before tackling one more riffle which produced the best fish of the day. Although not the biggest Brown I have caught it was certainly one of the strongest and nicely proportioned fish for a while. This second day of our trips saw a return to three species with a nice heavy Cutthroat and the best Rainbow I have taken on the White for some time. Two days had vanished in a flash of fluttering Caddis and talk of trips to come and trips already completed. We parted company in Harrison, us for the remaining part of our drive home and Jeremy for an appointment with his wonderful daughter Beth. Now we are told winter is to return so we are hoping the Caddis will hunker down and be back in action once Spring time returns.